Looking for a smart, small, lightweight, affordable charger for your small EV? They're here! Soneil chargers for lead-acid batteries from 6 to 72 volts. This vehicle was one of seven purchased by the Province of Manitoba from EVA. This specific car was the personal use vehicle of Premier Ed Schreyer while he was Premier of Manitoba - he was later Governor-General of Canada. He confirmed this to me when I met him at a conference where I displayed the vehicle. 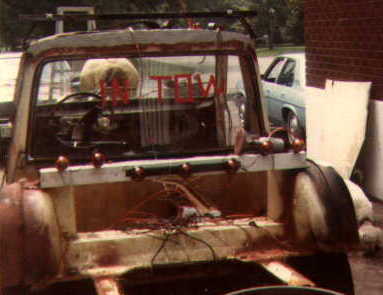 The vehicle was originally fitted with a Cableform Pulsomatic motor controller, a Baldor 96 volt series wound motor, 16 golf-cart (lead-acid) batteries, and a custom-built "Battery Marshall" charger for the main traction pack, and a separate ESB charger for the 12 volt accessory system. The motor was mounted to the original flywheel of the original 3-speed automatic transmission. The traction pack charger was capable of charging from either 220 volt or 110 volt circuits. 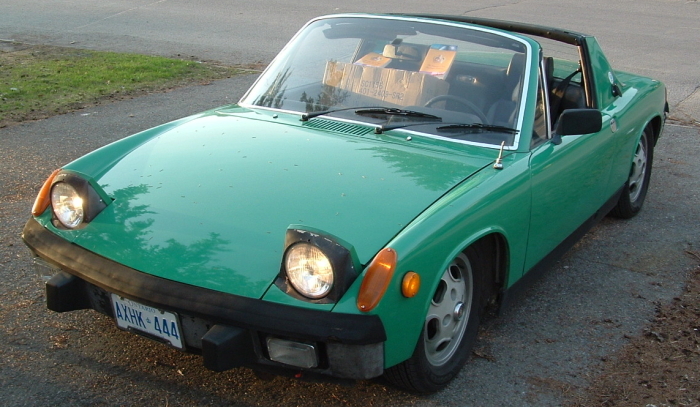 The original braking system was retained, with vacuum for the power-assist brakes being provided by a separate pump which drew power from the accessory battery system. 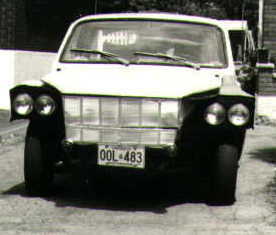 Two accessory batteries were provided in the original vehicle, a relatively standard starting, lighting and ignition (SLI) battery in the trunk behind the rear seat, and a very thin battery behind the front grill in the "engine" compartment, connected in parallel. Six traction batteries were mounted over the motor under the hood, and the other ten in the trunk, all in steel frames both above and below the batteries. The vehicle was reported to have reached 58 mph in this configuration. The vehicle also carried a gasoline powered heater in the trunk which heated fluid which was then pumped through the original heater core in the vehicle's dash area. A one-gallon gasoline tank was mounted on the side of the engine compartment to fuel the heater. I have made several changes the vehicle in the 15 years I have owned it. The gasoline heater has been removed and replaced by electric heaters that draw power from the main traction pack. There is only one accessory battery, mounted in the trunk. The original charger failed shortly after I started to use it, and has been replaced by a home-brew "Bad Boy" charger based on a Variac and a bridge rectifier, and more recently (1996) by a solid state (K&W) charger. The Baldor motors were not up to the task of powering this vehicle, and two failed in this vehicle. It currently uses an Advanced DC 9-inch motor. The original steel battery frames have been replaced with aluminum racks for the bottoms of the batteries only. The batteries are strapped to the racks using nylon web straps similar to seatbelt material. 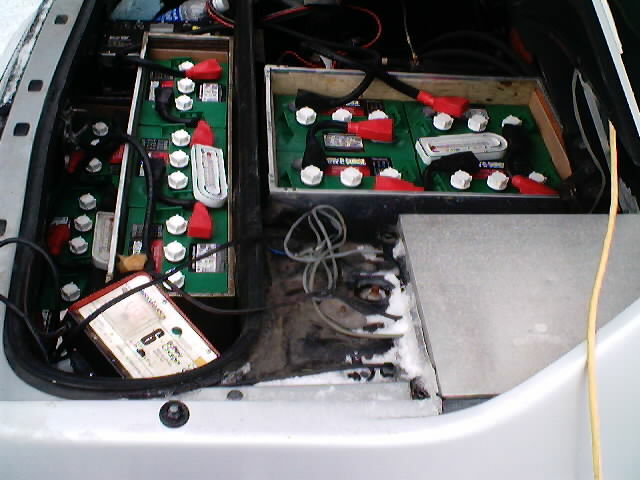 There are now 7 golf-cart batteries under the hood, and 9 in the trunk. The current battery pack is made up of Trojan T-125 batteries. The original automatic transmission has been replaced by a 4-speed manual transmission, retaining the clutch assembly. This has improved low-end acceleration (eliminating the wind-up of the torque converter), but reduced the top end speed slightly. Top speed I have achieved in this configuration is 66 mph according to the car's speedometer (106km/h). I have acquired a Curtis DC/DC converter to keep the 12-volt battery charged from the main pack, but this has not yet been installed. 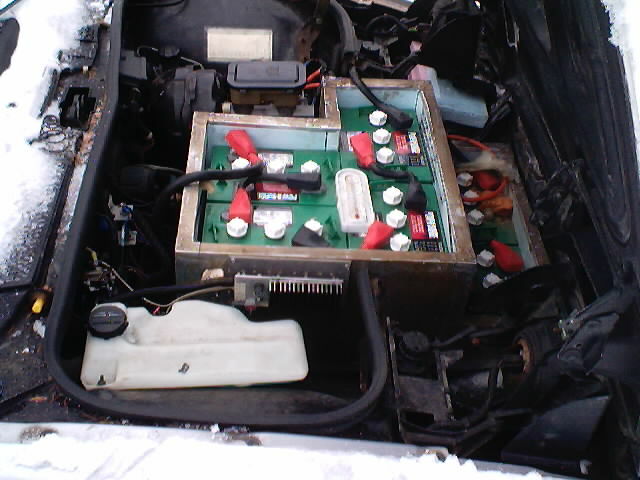 Acquired in November of 1999, this vehicle had already been converted to electric power in 1993 by REV Consultants and in operation as an electric for about 6 years. This car is intended for use solely as a commuter - the Fiero had very little space to start with being small 2-seater, with no space behind the seats in the cabin and a tiny trunk. It uses an Advanced DC 9-inch motor mated to the original manual transmission, retaining the clutch. Energy is stored in 16 x 6-volt golf-cart batteries (Trojan T-125's), providing a 96-volt power system. Six batteries sit up front under the hood (eliminating the spare tire well), and ten in the rear - using up some of the original small trunk. Power is fed to the motor by a Curtis 1209 (400-amp 120-volt) controller. Accessories are powered by an additional Series 24 deep cycle 12-volt battery to power accessories. A Vicor DC-DC converter charges the accessory battery from the main pack. This vehicle received some minor refurbishing (primarily brakes) before being returned to active duty in December, 1999. The charger is an on-board K&W BC20 set to deliver 8 amps and a maximum voltage of 120 volts. There are low-wattage heaters in each battery compartment (5) to maintain battery temperature during cold weather when the car is not being operated regularly. 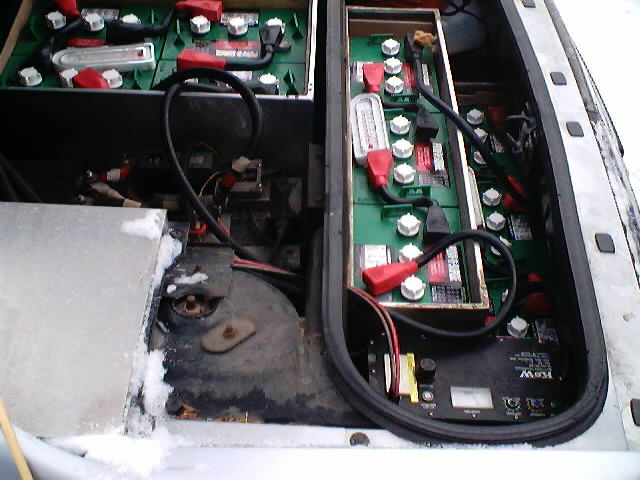 Cabin heating and windshield defrosting is done by wound-wire heating elements in the dashboard blower air channel. Top speed achieved so far is 130 km/h (80 mph), but this was in 4th gear, so use of fifth gear would likely allow a slightly higher maximum speed. Range is estimated to be 70 km on a charge. Trips of 50 and 60 km have been completed with no appreciable change in performance or sag in battery voltage. In March of 2001, the pack of Trojans was replaced with US Battery 6-volt golf cart batteries. The Trojan's had accumulated almost 20,000 km, and their life was undoubtedly shortened by severe overheating in early January 2001 (runaway battery warmers). After almost a year of operation, the USB's are operating flawlessly. The SpinCraft Explorer is a two-seater electric boat. It is manufactured by SpinCraft Electric Boats Ltd. in Gloucester, Ontario. The boat uses a relatively large 12 volt trolling motor mounted under the rear of the boat for propulsion, with the control head mounted between the seats, separately from the lower power unit. Energy is stored in either one or two deep-cycle lead-acid batteries, depending on the amount of energy storage required. There is an on-board charger. The boat has a top speed of about 10 km/h (6 mph), and will run for almost two hours at full speed on a single battery. Stock instrumentation is limited to a state-of-charge indicator ("fuel gauge"). Control consists of turning the boat on with a key, selecting the speed (one of five forward or two reverse speeds), and engaging the power. Operation is silent save for a slight wash behind the boat and this occurs only at the highest speed setting. The boat is constructed entirely of hand-laid fiberglass, and is very stable, both during operation and boarding and exiting. The one-piece, vinyl-covered seat cushion covers the back of the bench seat as well as the pan of the seat. The seat cushion snaps into place and is removable for storage. Our boat sports several of the available options including: the protective propeller cage; the running lights; and, the Bimini top. Other options include a bilge pump and a boat cover. Since we acquired our SpinCraft (June 30, 1996), we have added a photovoltaic panel (solar cell) to the rear deck lid, and an ammeter to monitor power consumption. The PV panel is rated at 33 watts peak power, 19 volts maximum, using a regulator to ensure that the voltage to the battery does not exceed 15 volts for charging. The PV panel supplied approximately 40% of the energy required for charging the boat during our first season of operation. For more information about the SpinCraft, please contact Zevco at (613)824-1702 if you live in the Ottawa-Hull area, otherwise contact [Site no longer exists: http://spincraftboats.com/] SpinCraft Electric Boats via their web site or at (800)313-7913 from the U.S., or at (613)746-1009. (looks like company is no longer in business (June 2018). Our boat is not exactly like the image available here (lifted from the sales brochure). Our boat has hinged deck hatches, a collapsible cloth top, navigation lights and a solar panel on the rear deck. Still, it is a very good likeness. I purchased this one, a model E12, in January, 1998 from the original owner. 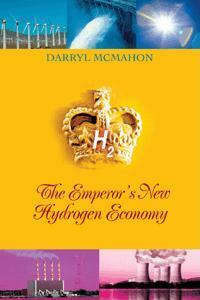 He purchased it in 1973 while living in British Columbia. It was not operational when I purchased it. After repairs and refurbishing, it is now operating again. It will spend its winters primarily as a snowthrower, and summers will be used for landscaping, gardening and doing minor road work around our cottage. This tractor came with the front-mounted rotary mower, snow-thrower, dozer blade, rear-mount roto-tiller, electric rear lift, a hand-held hedge trimmer and a hand-held cultivator. Since then, I have acquired a rotary broom, which has been used to sweep a local race track. This was originally a demonstration project vehicle for a course on how to build electric vehicles. 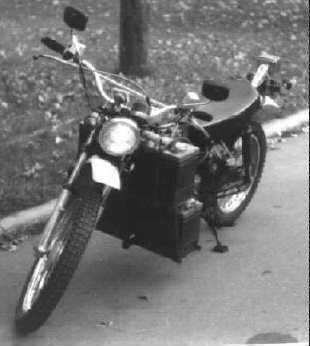 I chose the motorcycle because all the components are easily visible, the drive-train is simple and obvious, and because it had to be transported to and from the class each week due to a lack of storage space at the school. It saw semi-regular use for 2 summers, and irregular use for an additional year before it was cannibalized for its batteries and charger. The vehicle had a cruising speed of 45 mph, which was more than adequate as electric motorcycles are not permitted on limited access highways (speed limits of 50 mph or more) in Ontario. Speed control was primitive, using two steps of starting resistors, and manually-controlled pulse-coast mode for speeds from 20 mph to 40 mph. Over 40 mph full voltage was left applied to the motor. I still have the frame, which was reworked to take 36 volts (three 12-volt batteries) instead of the original 30 volts (five 6-volt batteries - shown in the photo - one sits between the rider's feet). The aircraft starter/generator is still in place, and the frame is available at a nominal fee for someone who wants to take the plunge on a small budget. If I were to work on this again myself, I would install a solid-state motor controller (for the armature), increase the gear reduction to improve acceleration from stop and reduce the cruising speed, and utilize field-weakening to regain the top-end speed. I purchased this motorcycle in 1998, without batteries and in need of repair. After reviewing the wiring (found a problem in the charging circuit), repairing the drive sprocket so it would not slip, and making some other small repairs and adjustments, I acquired the 2 series 27 deep-cycle batteries the bike needed to try it out. It worked like a charm. It is too small to be safe on the roads with SUV drivers more intent on their cell-phones than other vehicles on the road, but is superb for quick transportation in more protected situations. It was very handy for moving between locations at the Speedway at the 1999 Electrathon. This was my very first project, high on learning and low on budget. In the mid-70's there was not nearly the body of literature available on the subject that exists today. 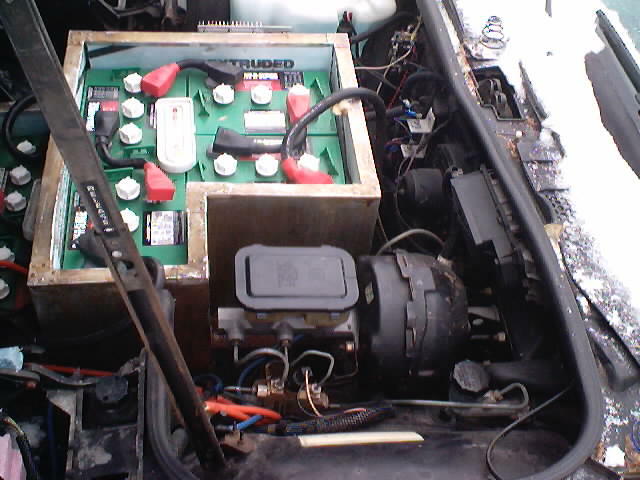 The vehicle was given to me, the starter-generator came from a surplus house, the cabling was bought from a scrap yard...you get the idea. This was being built using the "spare cash" of a full-time university student (oxymoron). At 48 volts, using eight 6-volt truck starter batteries, it had a range of about 12 miles on a charge, and a maximum speed of just over 40 mph in 2nd gear. In first gear it would nearly climb straight up! It wasn't pretty, it didn't have much range or performance, but it worked and I've been hooked on pollution-free transportation ever since. I eventually disassembled this vehicle to sell off the parts, and ended up close to breaking even. I don't know why, but I have had several requests for images of this nasty brute. OK, I found some. Any prescient similarity between the shape of the nose of this vehicle (1978-81) and the current line of Dodge Ram trucks is purely coincidental (but if Daimler-Chrysler wants to send me a cheque, it's OK by me).